We finally got to a place with a fast enough Internet connection that allows me to upload video. 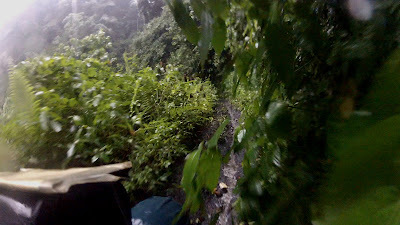 Here you can watch part I and II of the extreme journey across the jungle described in the previous post. I do recommend reading that post first, as like it's always the case, written language can tell things that cannot be appreciated through video. I highly recommend watching them in HD and fullscreen. Two of the toughest bike travelers I know, Salva and Adam, both good friends of mine, met in Sulawesi in 2009 and together they embarked on a journey that both described as unforgettable, not only for its outermost beauty, but also for the difficulty and intensity of the journey. When I consulted Adam about the possibility of doing such this ourselves, he said: "The ride through Kalimantan (which he had also recommended) is indeed hard, but the ride through the jungle in Sulawesi is actually extreme". If that had come from someone who has no clue about traveling by bicycle, I would not have payed much attention. However, a comment like this, coming from such an experienced cycle traveler like him had to be taken seriously. Before the time finally came, hardly a day went by without thinking whether it'd be possible for us to do this jungle stretch, I was even unable to catch sleep easily! I wasn't really worried about myself, after all it wouldn't be my first nor my last extreme journey but I wasn't really sure whether Julia was already prepared for such an extreme endeavor. However, Julia and I are very much alike in one particular thing: even when we are not sure if we can or cannot pull something off, we both like to take the shot anyway and go into it to put ourselves to test, even if that means we'll be cursing the whole way due to the strong adversity, because having failed to do so, the thirst for adventure and the need to push our limits, wouldn't allow us to keep living at ease if at least we hadn't tried it . It would mean keeping on living with the unbearable thought of not having tried and the countless "what would've happened if's ...." that would come along with them, this is a very heavy burden and believe me, it is really annoying, you just can't get over it. The road was there. It was just a we-do-it-or-not question. After all, there were only 120 km or so. Finally, by an unanimous decision, the answer was YES! and f**k it was worth it! It had been quite a long time ago, still during the planning stages of this trip, that two cycle travelers friends' of mine told me that Sulawesi was without a doubt, among the best islands of Indonesia for cycling, so we got there with the greatest of the expectations. Even though I tried to imagine it, I didn't actually have a very defined idea of what the island would be like. After a full month and more than 1500 km cycled there, an epic journey across the jungle and having turned 35 there, I can confirm that Sulawesi is one of the most spectacular places I cycled in, in the almost 35.000 km I have cycled until today. 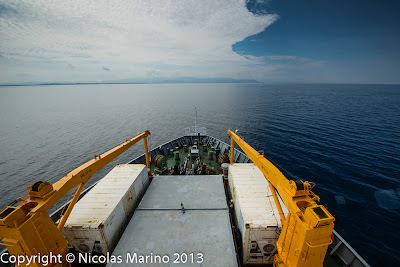 We got to Pare Pare after our first long-haul trip on board of the Bukit Raya, one of the several ships of PELNI, the national ferry company of Indonesia that connects most of the islands of the country. 19 hours of quiet navigation on an almost empty ferry with a capacity for thousands of passengers.